Gina Haspel has been sworn in as the first woman to lead the US Central Intelligence Agency, with a pledge to send more officers into the field and strengthen the agency’s working relationships with US allies. Haspel, a career CIA operative, said Monday that she was honored to be chosen to lead the intelligence agency. “I stand on the shoulders of heroines who never saw public acclaim, but served as inspirations to the generations that came after them. 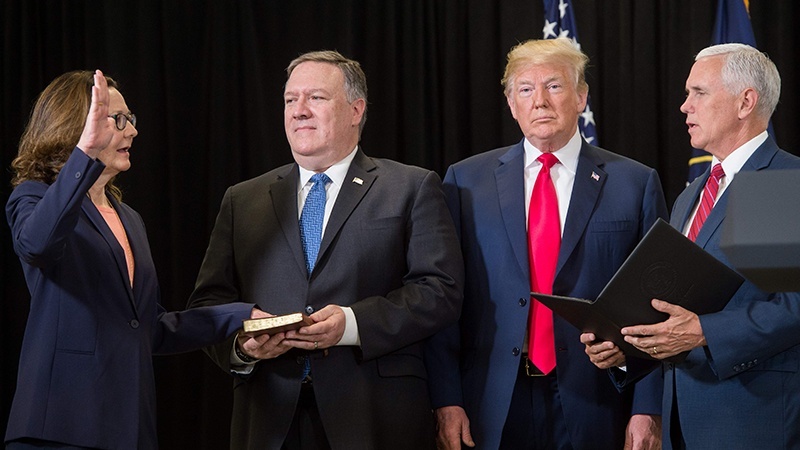 Mr. President, thank you again for giving me the opportunity to serve, to represent the men and women of CIA and to carry out the critical work of helping protect our country, our people and our way of life,” Haspel said after being sworn in. Her nomination was fraught with controversy because of her past role in the CIA’s torture program and interrogation of terror suspects after the September 11, 2001 attacks. She was confirmed by the US Senate on Thursday, with a vote of 54 to 45. Haspel’s critics on Capitol Hill complained that anyone who was a part of that program should not be promoted to the top job. According to records recently declassified, Haspel supervised the torture of detainees, including the use of waterboarding, and ordered the destruction of the video evidence of those practices. The most controversial part of her career came after the 9/11 attacks, when she was put in charge of a secret CIA black site in Thailand, where at least two al-Qaeda suspects were tortured during interrogation. Despite her controversial past, Haspel’s rise is not entirely surprising. She previously served as the CIA deputy director and led undercover spying operations across the world. President Trump praised Haspel during her swearing-in ceremony, saying there was “no one in this country better qualified” to lead the CIA. “Instead of apologizing for our nation, we are standing up for our nation and we are standing up for the men and women who protect our nation,” he said.